Gift cards are one of the most popular giveaways for businesses because they offer an additional revenue stream, promote brand and product awareness and they increase customer loyalty. Take a look at some of these stats from CashCard about the power of gift cards. • Customers are 2.5 times more likely to buy something for full price if they pay with a gift card. • 72% of customers will spend MORE than the value of their card. On average the recipient will spend 20% more than their gift card value. • 55% of gift card recipients require more than one trip to spend the balance of their card. These are some pretty hard stats to ignore. Luckily, social media campaigns provide a perfect outlet for offering up a gift card to your fans. Even better, you can also collect some extra information (such as an email address) and really start to build that relationship and turn your fans into loyal customers. Here are 4 best practices to keep in mind when running a gift card giveaway. 1. Show the gift card amount: There are times when people don’t like being surprised, and when you’re doing a gift card giveaway, you’ll want to make sure it’s very clear how much your gift card is worth. In today’s example, Cafe DeLuxe includes their gift card amount twice on their campaign, so there’s no question what people are entering to win. 2. Consider the amount: Have you ever received a gift card for $5? In today’s world, most $5 gift cards won’t get you very far. If a gift card is too small in comparison to your average product price, you run the risk of people not wanting to spend that extra money. Sometimes it benefits to give a little more to see a good return on your investment. Remember that 72% of visitors will spend MORE than the value of their card, so make sure your gift card amount is strategic enough that they can afford a nice sample of your product. Cafe DeLuxe is a breakfast and lunch spot located in Reno, Nevada. I actually happen to be very familiar with the restaurant because I live in Reno, so I know that for $30 I will be able to have at least one good breakfast or lunch with a partner and still have money left over on my card. Then, the next time I go back I won’t mind making up the difference because I already received a free meal. It’s a win win for me and the restaurant. 3. Give away multiple gift cards: One of my favorite things about Cafe DeLuxe’s giveaway is that they’re running an ongoing monthly promotion. Every month they’re giving away a $30 gift card but every day they are collecting entries from their followers. By having an ongoing campaign they are continuing to grow their email list in addition to taking advantage of the benefits of a gift card giveaway. 4. Have a follow-up strategy: If you’re going to ask your fans to enter for a chance to win a gift card, we recommend having a solid follow-up strategy for those that don’t win. A great idea would be to offer a gift card of a smaller value. Maybe everyone who enters that doesn’t win, gets a $10 gift card, a free dessert or appetizer. Another idea would be to tell the people who didn’t win to come in and eat and mention that they entered your giveaway and they’ll get 10% off their bill. It’s a small gesture that gets people through your door without taking too much money out of your pocket. If you don’t have the budget to offer everyone something, make sure you’re adding your entrants to an email list where they can learn more about what’s going on with your business and specials they can partake in. 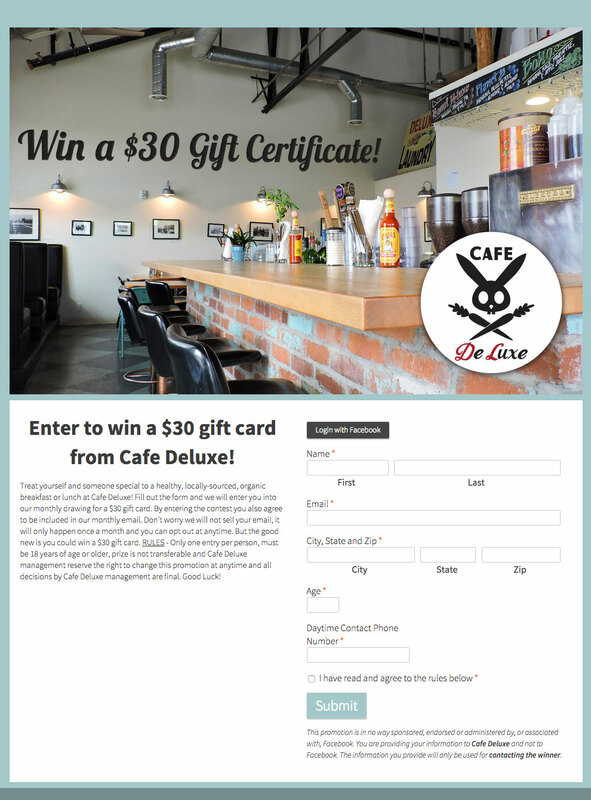 Cafe DeLuxe is running a monthly giveaway for a chance to win a $30 gift certificate to their restaurant. In addition to their gift card giveaway they are building an email list with all of the entrants. The promotion is simple, yet effective in it’s design, and there is no confusion on what the prize is or how to win it.